Home > Nucleic Acid Purification Systems and Kits > Genomic DNA Purification Systems and Kits > Gibson Assembly® HiFi 1 Step Kit, Synthetic Genomics Inc.
Gibson Assembly® HiFi 1 Step Kit, Synthetic Genomics Inc. The Gibson Assembly process begins by designing dsDNA fragments with 20 – 40bp overlapping ends. 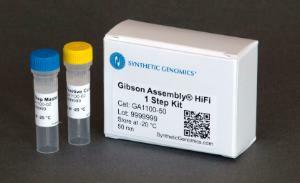 For the Gibson Assembly HiFi 1-Step reaction, these DNA fragments are combined with a 2X Gibson Assembly® HiFi 1-Step Master Mix and incubated. This during this time, complementary ends are generated, annealed, and sealed. This this one-step, isothermal process can be performed in less than 60 minutes and results in a transfection or transformation ready, double stranded, fully ligated DNA construct. The GA 1-Step Master Mix (2X) contains a proprietary mixture of enzymes and reagents optimized to facilitate one-step assembly of double standed DNA fragments. This mastermix includes a proof-reading polymerase that mediates junction repair resulting assembled constructs with low rates of junction errors and high sequence fidelity. The GA Positive Control (2X) is sufficient for 2 reactions (5 and 10 reaction kits) or 5 reactions (50 reaction kit). This control consists of a mixture of 10 ng of a 1.5 kb insert and 30 ng of a 2.7 kb vector containing an ampicillin resistance gene. Selection for the 4.2 kb assembled construct can be performed using LB agar plates with 100 μg/ml ampicillin, 0.1 mM IPTG, and 40 μg/ml X-Gal. The Gibson Assembly method allows the insertion of one or more linear double stranded DNA fragments into a virtually any vector without the need to rely on compatible restriction sites. Gibson Assembly is significantly faster than traditional restriction enzyme digest-based cloning and proven for the cloning of both small and large double stranded DNA fragments. Using the Gibson Assembly® HiFi 1-Step Kit, the simultaneous cloning of one to five inserts with sizes ranging from 500 bp to 32kb can be accomplished in a single tube, in a single step, using a robust isothermal reaction that yields cloning efficiencies of greater than 90%. Ordering information: Kits with 5, 10, or 50 reactions are available. All kits contains one vial of GA 1-Step Master Mix (2X) and one vial of GA Positive Control (2X) and a detailed instruction manual.